Well it had to happen. 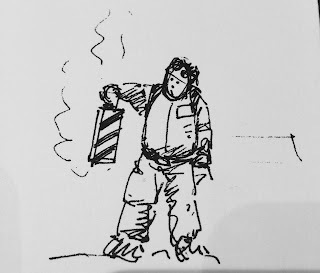 Not a month in and I've decided to write a Star Wars article. Clearly I'll do anything for increased blog traffic. It really comes down to this: a couple of years ago in a conversation far far away there were mutterings of discontent (nay disgust) when it was announced that Disney were buying the rights to Star Wars. The evil empire had won. They were going to take all that was good and whole in the world and destroy it. They'd be taking a spectacular piece of modern mythology and dumb it down, merchandise it to kids, rip out its heart and soul, and generally do bad things. Which would be terrible because George Lucas had guarded the sanctity of this wonderfully built universe so admirably. He'd done a stellar job so far, hadn't he. Well no, he hadn't. My initial reaction to Disney getting Star Wars was "well they can't do a worse job can they?" Finally someone was going to take control of Star Wars off the old jedi and inject some much needed quality into it. I'm not going to get on the Phantom Menace soapbox (not yet at any rate) but the signs were there. Anyone who grew up loving Star Wars holds it very dearly in their hearts. I can remember watching it round my friends Paul and Matt's house when it was on telly and being totally blown away. I remember the Return of the Jedi sticker book I had in primary school, and redrawing Luke's fight on the skiff near the Saarlac Pith until I got the picture just right. I scoured junk shops and flea markets with my mate Ned to get hold of anything Star Wars related and we spent all our pocket money on Star Wars figures. But we should have seen it coming. We put up with the Ewoks because we were kids and didn't know any better. We even watched Caravan of Courage hoping for it to be good. We were patient with George constantly trying to re-edit and update the films using the latest CGI. We laughed off the song and dance number from Return of the Jedi. We turned a blind eye to Greedo shooting first. But then the new films came out. And we wanted them to be good. Oh how much we wanted them to be great. But they weren't. And this has nothing to do with destroying my childhood (you should see my previous post for my views on that) but everything to do with the fact that Star Wars dumbed itself down massively. The comedy was crass, the acting abysmal, and it became little more than 1950's America in space. Yes, Disney have some questionable ways of doing business and I think their legal department probably have a well deserved reputation. But they know how to make movies and build franchises. There was never any danger of Mickey Mouse turning up in a Star Wars film (I'm more worried that some people actually believed this would happen). But do you think Disney would have allowed Jar Jar Binks an inch of celluloid? Sorry, it's hard not to drop the J-bomb but it looks like Disney has the nous to really do a great job with Star Wars. And they are playing it pretty well so far. The Force Awakens opened without a Disney logo in sight and they absolutely nailed the look and feel that made the first films so popular. Yes, they played to the fans, but that was absolutely the right thing to do in the circumstances. The excitement around Rogue One looks pretty stellar too. And they seem to have brought balance to the films, it's a grown-up universe that treats its audience in a mature way that kids will find thrilling. It doesn't look like there's any danger of hard edged sic-fi being put alongside dopey "Roger Roger" droids. I can't wait for the next movie. 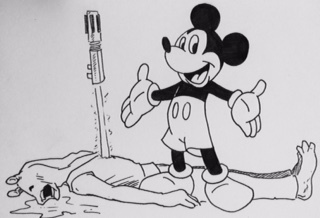 So while you wait for that to turn up in cinemas, here's a picture of Mickey killing Jar Jar! Well this is it. I've decided to start a blog. It's worth being clear here too, my plan isn't to write up the minute film reviews about the latest blockbuster or indie gem, it's to have a place where I can write about all the things I love (and hate) about movies. It'll be varied, some of it may be opinionated, but all of it will mean something to me. You could probably make some inference about psychology and where films fit into both my view of myself and the world, but mostly it'll be me writing about things that interest me. Hopefully they'll interest you too. I have loads of favourite movies (there are many, and they change in order depending on my whims). I love all sorts of genres, I'm as happy talking about action movies as I am about art-house. I studied film theory and history years ago so am writing this under the belief that I know what I'm talking about (have no fear, after a couple of posts you'll realise I'm winging it). The plan is to post new content every Monday. Sometimes I may get carried away and write more than one post a week. I'm not planning on writing massive essays, so you should be able to read them in the time it takes to drink a coffee. I'd love to know what you think, but I'd like you to keep your comments friendly. 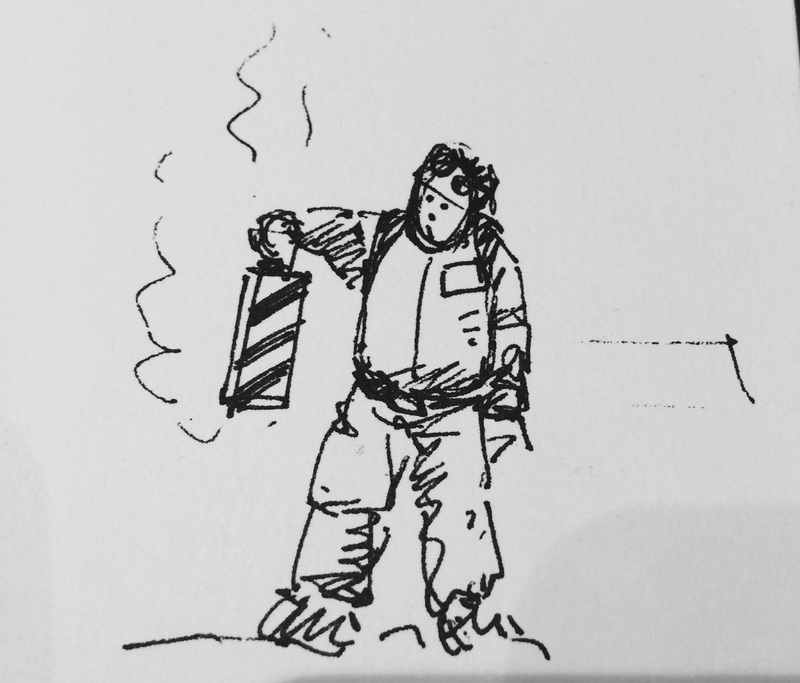 If you're lucky I may draw a cartoon to go with a blog post (it certainly beats being sued for using someone else's imagery). There are friends of mine who don't watch films with subtitles, and it's a phrase I hear quite a lot. For me, language isn't a barrier to watching films. In fact, quite the opposite. Film has a visual language all of its own, and a well made film can take you on a journey no matter the country of origin. I'd like to share some of my thoughts on this, and other issues, with whoever is interested. Anyway, that's it for my first post. I'll be back next week (Monday, as promised) to dazzle you with some stunning writing.